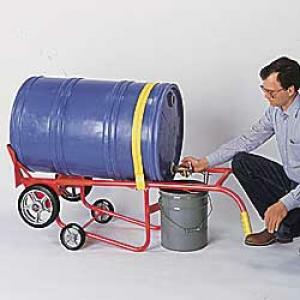 Easily transport and dispense liquids from standard 55- or 30-gal. drums with the WESCO 4-Wheel Drum Cradles. Frame includes non-sparking polyolefin rollers that rotate drum without removing it from the truck. Drum may be picked up from any side since spigot can be rotated to the bottom. Special chime hook fits beneath spigot and won’t interfere with dispensing. Structural pipe-sized steel tubing frame. 24"Wx56.5"H frame.